Outside Pilot Watch House. (left to right) Back Row: T.Y. Purvis, Wm. Phillips, James Wright, E.C. Burn. Middle Row Harry Purvis, Robert Ramsey, Harry Young, A.L. Ayre, T.H. Purvis. Front Row: Joe Marshall, W.O. Purvis, John Cree. Back Row: T.Y. Purvis, Wm. Phillips, James Wright, E.C. Burn. 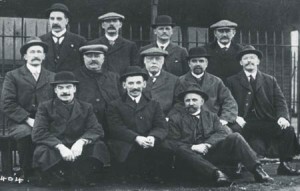 Middle Row Harry Purvis, Robert Ramsey, Harry Young, A.L. Ayre, T.H. Purvis. Front Row: Joe Marshall, W.O. Purvis, John Cree.